A quarter of a century after the birth of modern Albanian capitalism and Tirana now boasts more or less everything the modern shopper requires, much of it conveniently tucked away inside the city’s growing collection of Western-style shopping centres. If you prefer doing what the less well-paid locals do and would like to go native, there remain plenty of cheap and cheerful shops staffed by a battalion of grinning proprietors, many of them more concerned with where you’re from and if you have a husband or wife than what you want to buy. Outside the city centre, certain streets often cater to singular tastes such as bicycles, second-hand clothes and furniture, almost all of it available for cash only. Tirana boasts a number of shops selling English-language literature, although the selection isn’t great. It’s recommended you bring books or an e-reader/tablet if you want to read anything specific whilst you’re here. A small selection of foreign newspapers and magazines can be found at Adrion International Books as well as in the Xheko Imperial and Sheraton hotels, although the internet is slowly killing this trend off. Anyone with a cardboard box, a few packets of cigarettes and a square metre of pavement is effectively a market trader in Tirana. Whenever it rains, people will appear as if by magic, armed with a clutch of overpriced umbrellas designed to stay in one piece just long enough to outlive the downpour. The best souvenir shopping is in Kruja, where shop windows are full of jewellery, antiques and knickknacks. If you don’t have time to get there, check these shops in Tirana. There are also some kiosks selling Albania mugs, plastic guns, dolls and bunker ashtrays at the southern end of Rr. Barrikadave. Albanian cheese and other foodstuffs also make excellent gifts if you can get them home without eating them all on the plane. Many fashion outlets are now relocating to the city’s ever-increasing selection of shopping centres. 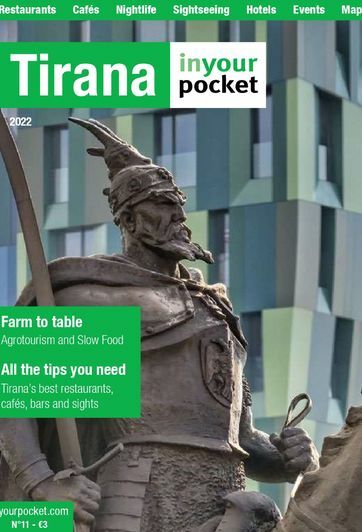 As with so many things in Tirana over the past few years, supermarkets have evolved from a scattered selection of family-run businesses into a more Western-style approach with local and international chains opening relatively small supermarkets on an almost daily basis. The following three chains stock plenty of familiar Western goods and all accept credit cards. The following places provide services rather than goods to buy. If you need something like a memory card or battery charger for your camera, the best place to go is the Neptun shop in TEG (see Shopping centres).